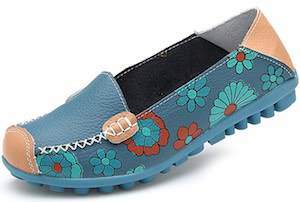 Now there are some fun floral slip-on shoes that are just made for a summer walk. These women’s shoes come in blue, orange, red, and yellow and just look fun and they come in women’s sizes 4.5 – 11. The shoes have a leather upper and durable rubber sole that has the same color to fit the shoes design. Now you just have to pick the perfect color shoes for your outfit and you will be enjoying this footwear a lot.